The Hotel Swiss is located in the center of Kreuzlingen. Look forward to a vegan restaurant, in the morning a breakfast buffet is ready for you (CHF 18.00 per Person). Private parking is available for CHF 10.00 per day. This luxury hotel has a lounge bar and a terrace. Guests of the hotel enjoy free use of Wi-Fi in all rooms, express check-in / check-out, Luggage Storage, Wi-Fi in public areas, parking in front and behind the house. A bar / lounge and a terrace are further highlights, and all rooms at this hotel have a minibar, safe and free WiFi. 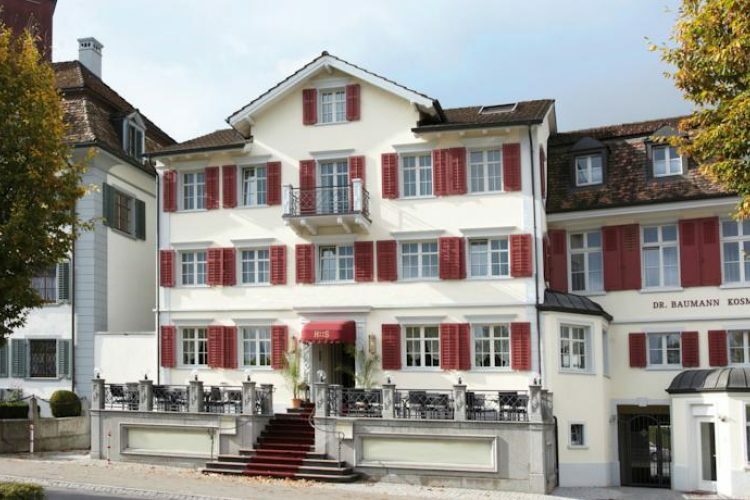 Hotel Swiss is located in the centre of Kreuzlingen, 400 m from Lake Constance and 800 m from Konstanz old town. There were two compelling arguments for favoring a vegan restaurant in the hotel: The culinary well-being and health of our customers is a priority and we do not want anyone who suffers or dies for our needs or the needs of our guests. In addition, the vegan diet is best for the environment, the climate and animals. Our restaurant, Roter Schwan is the perfect place for a memorable evening. Gourmet chef Raphael Lüthy will delight you with his culinary talents and enchanted specialties. The bathrooms are equipped with products SkinIdent Dr. Baumann. These products are under the Bionome quality label because they have the highest quality standards for the health of the skin and body. Again, all products contain no animal ingredients. Pillows and duvets are 100% cotton sateen and are therefore suitable for allergy sufferers. 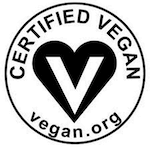 The Certified Vegan logo is a registered trademark signifying that products are vegan, defined here as containing no animal ingredients or by-products, using no animal ingredients or by-products in the manufacturing process, and not tested on animals by any company or independent contractor. The logo is administered by the Vegan Awareness Foundation, also known as Vegan Action, a nonprofit organization promoting veganism. The program relies on written statements by companies and suppliers that the product is vegan. Best vegan hotel with the best kitchen. Love to stay there. Nice hotel, good breakfast. Good value for money. Great vegan hotel! Ofers a all-you-can-eat bruch every month. Food is delicious here and is beautifully decorated. Outstanding vegan restaurant, well worth the visit. Advance reservation recommended. Decent vegan (!) hotel with spacious and bright rooms, kind of old-fashioned but not in a disgusting or disturbing way. The yet rather small breakfast still offers a large variety of jams, jogurts, bread, salads, milks, water, sort of honey, and vegan cold cuts and cheese. Friendly staff and interesting concept even for meat-lovers like me. Would stay there again! Fantastic hotel with a incredible breakfast spread (included). The host is very friendly and willing to answer any questions you may have. It is located about 15 minutes from the old town/border to Germany. Can't recommend it enough! I was very happy with my stay at Hotel Swiss. The staff member I encountered was cheerful and very helpful. My room was spotlessly clean, the bed comfortable and breakfast, while vegan, offered plenty of variety. All in all am excellent experience. An interesting breakfast concept. Slept well here. The hotel and decor are beautiful. We didn't eat at the restaurant for dinner but tried the breakfast buffet. I didn't even notice the food was vegan (the butter! so good). Pear Syrup- much like a maple syrup made of pears; very flavourful and a must-try. I notice the difference in food from North America more with the vegan selection. The soy milk/vegan sausage/butter is miles above anything I've tried before. The beds are good. We were 3 people in a double room but I had a very comfortable sleep even on the cot. The bathroom is partitioned so someone can be at the sink and another in the toilet. We found that convenient for three travellers as it saves a lot of time. It is a half hour walk to Konstanz from the hotel. Service génial, acceuil de la clientèle chaleureux, chambres très bien arrangée et de bons repas. Merci pour ce séjour et je donne 5 étoiles sans hésiter.